Africa is a melting pot of culture and wildlife, and a safari is the best way to experience it. From the Western Cape to the wilds of South Africa and Botswana, join us on our African Cruise Safari! True to its meaning, our Safari will be an expedition to observe Africa's wildlife in its natural habitat. We'll explore by bus, boat and jeep to bring you the very best African wildlife safari. Starting in Cape Town discover South Africa’s culture, valley and vineyards before enjoying the diverse wildlife of Kapama Private Game Reserve. Travelling to Botswana enjoy some safari lodge luxury in Botswana's Chobe National Park – home to 45,000 roaming elephants as well as lion, leopard, giraffe, cheetah, buffalo and over 450 species of birdlife – before spending three nights cruising the Chobe River aboard the Zambezi Queen. To top it all off, enjoy three glorious nights at Victoria Falls. Arrive into Cape Town at your leisure and meet your Expedition Leader and fellow expeditions for a sumptuous welcome dinner. Enjoy a full day exploration of the Cape Winelands region, sampling a wide range of local produced wines and cheeses. We’ll spend time exploring Cape Town’s colourful Malay quarter and Milnerton Lagoon’s spectacular views of Table Mountain as well as enjoy a cultural dining experience at one of Cape Town’s finest African restaurants. We take a mid-morning flight to Hoedspruit and transfer to our lodge in the Kapama Private Game Reserve, situated in South Africa’s northern most province of Limpopo and renowned for its prolific and diverse wildlife, including over 40 different mammal species (including the famous Big Five), over 350 bird species and a myriad smaller species. Predawn safaris feature the departure of night predators, the dawn chorus and visits to many local waterholes. We rest during the hottest part of the day then board our open-sided Land Rovers for a night safari before returning for dinner and entertaining talks. Our charter flight to Botswana offers a spectacular bird’s-eye view across the African landscape. Arriving into Kasane we travel to luxury Mowana Safari Lodge, set amongst baobab trees with magnificent views to where the Chobe and Zambezi Rivers meet. 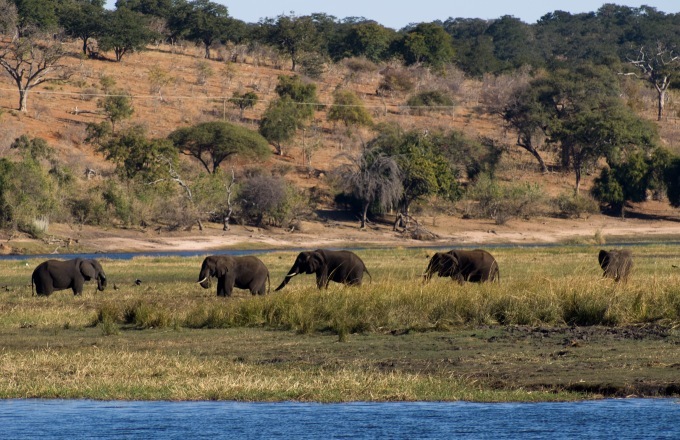 In the surrounding Chobe Game Reserve, some 45,000 elephants share their lands with lion, leopard, giraffe, cheetah, zebra, buffalo and more than 450 species of bird. As in Kapana, our our overland safaris will be early in the morning and early evening, with a rest in the middle of the day. Today we board Zambezi Queen on the Chobe River. Over three days we delight in viewing Chobe National Park’s teeming wildlife from the open air lounge or from watercraft that allows close views of the wildlife that has come to bathe and drink. Generator free evenings allow us darkness for stargazing and the stillness to enjoy sounds of the Africa night. Disembarking the Zambezi Queen, we make our way to Victoria Falls and the elegant Victoria Falls Hotel for three nights, delighting in the magnificent views over the Fall’s Bridge to Zambia. A sunset cruise on the Zambezi River reveals crocodiles, hippos and birdlife, while on a trek through the rainforest, we learn local legends of ‘The Smoke that Thunders’. Enjoy a traditional Boma dinner, featuring kudu, warthog, crocodile and the local delicacies like Mopani worms, while being entertained by tribal dancing and storytelling. Today we transfer to Victoria Falls Airport for our flight to Johannesburg and our trip’s end. The Zambezi Queen offers 10 suites and 4 master suites. The 28-passenger Zambezi Queen is as unique and adventurous as it is comfortable and elegant. Offering world-class sophistication in one of the most remote locations on Earth, each of her 14 suites offer remarkable game viewing from the comfort of your bedside. Featuring all of the mod-cons, the Zambezi Queen boasts an open-plan, air conditioned lounge bar and dining area, all protected by mosquito screens which allow for a comfortable and pleasant environment for dining and relaxing. Two public outside spaces offer a shaded area with comfortable seating and another includes a pool and sun bathing area. All items of a personal nature including, but not limited to: alcoholic beverages and soft drinks, laundry services, personal clothing, medical expenses, gratuities, and email or phone charges. Aurora Expeditions may for any reason change the date of departure or conclusion of the tour, the scheduled point of departure for the tour, omit or change any scheduled stop on the tour or change the scheduled place of conclusion for the tour whether before or after the tour has departed, without prior notice to you. You will have no right to any refund and Aurora Expeditions will have no obligation to you or be liable for any loss, consequential damages, expenses, loss of time or enjoyment or inconvenience in respect of such changes. Aurora Expeditions reserves the right to cancel any tour prior to departure in which case any payment made by you will be refunded in full and you will not be entitled to make any further claim for compensation or damages, for any loss, consequential damage, expenses, loss of time or inconvenience which may result from such cancellation.